According to the legislation of many countries, TV-companies must label their production with the graphic identifiers of age for which it is intended. As a rule, there are several age restrictions: everything that is allowed for watching by kids on-air up to six years (0+), after six (6+), after twelve (12+) and after sixteen (16+). If TV-channels consider their production as inappropriate for broadcasting for kids and teenagers, they label it with a mark У18+Ф. LetТs consider an opportunity of the SL NEO platform to automate playback of graphic objects with using the technologies of parameterization and auto generation of the secondary graphic events. Step 1. Create a graphic clip - template. In the application Air Manager create a new graphic composition that will be a template for all displayed graphic markers. In our example the composition contains two layers: a semitransparent backing and a text layer. Set the types of transitions for the text layer to the input (Mix In) and to the output (Mix Out) - Fade, choose the 6 frames duration for every transition. You can set the same transition parameters for the backing layer. Set the duration of the whole graphic event (clip) equal five seconds (in the tab General, field Duration). Save the graphic clip with the name Marker in the server database. Step 2. Create a new rule for auto generation of secondary events. Configure the new rule in such a way that any text entered into the playlist field GPI V1 (GPI1 Value), would be broadcasted to the graphic clip with the name Marker and be displayed synchronously to the start of the main on-air event. In the application Air Manager open the window Broadcast for the chosen playout channel, by the right-click choose the item Secondary Event Generation Rules. Choose Add in the opened window. You will see another window for selecting parameters. Enter a random name for the new rule in to the field Rule name (e.g. 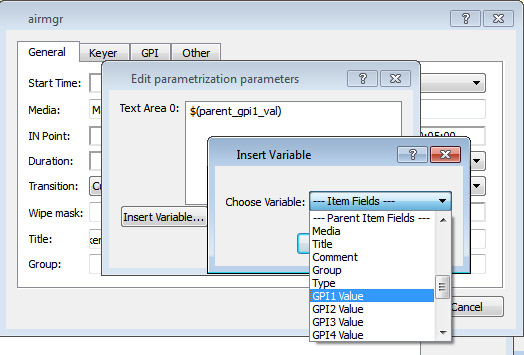 Marker), choose GPI1 Value in the field Trigger Column. Select Is NOT Equal in the field Operation, set 0 in the field Trigger Value. These parameters mean that secondary events will be generated all the time, when the value in the playlist column GPI1 Value is not equal 0. Choose Add in the lower section of the setting window and pass on to the next window. By the button ... in the field Media (tab General) choose the clip-template (in our example it is the clip Marker from the server database). By the button Params in the field Media set the playlist column from which the application will read off the text data: in the field Text Area select the text У12+Ф, press Insert variable and choose GPI1 Value in the section Parent Item Fields. Return to the window Edit parametrization parameters and set the value Fixed and the duration of five seconds in the field Duration. 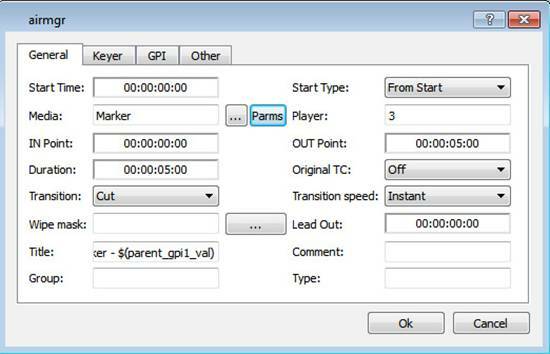 Get back to the window for choosing a clip and check the parameters IN/Out Point, Duration. In the field Player you should specify the number of the graphic layer in which the clip will be played out. Player is a virtual layer/playlist that implements graphics playback. Since the full screen layer has the value = 1, respectively, the value for the first graphic layer = 2 (by default Ц Auto, the window Broadcast Layer 1), for the second graphic layer you should set У3Ф etc. SL NEO servers support up to eight graphics layers, thus, you can distribute graphic events by the layers. Step 3. Mark the clips in the server database. The window Media Browser contains fields User 1 ... User 8 for every clip. If you enter the text into them and place the clip into the playlist line, the text from these fields will be transferred to the playlist fields GPI V1 ... GPI V8. For implementing our task, it is enough to specify the corresponding text in the field User 1 (for example, 0+). Now you can check the work of a new rule - place the clip to the playlist line, and the application will automatically generate the secondary event that will appear in the list of secondary events, the value from the field User 1 should appear in the column GPI V1.